The Peak Downs Highway is a key transport route connecting the regional city of Mackay to the mining and agricultural areas of Central Queensland. Eton Range is used heavily by oversize vehicles servicing mining and agricultural industries, as well as general motorists travelling to and from work centres. The Eton Range Realignment Project will upgrade the existing range crossing to provide a split carriage way, with two lanes in each direction. The new alignment will have a reduction in grade to improve safety for heavy vehicles, and other measures to help control approach and departure speeds. Eton Range, Peak Downs Highway. The project is part of a $167.17 million commitment by the federal government to improve safety on the Peak Downs Highway. Working with the existing terrain to achieve the new alignment poses a complex geotechnical challenge. The most critical part of the project involves constructing a reinforced earth embankment to widen part of the existing range, which will be 780 metres long and 45 metres tall at its highest point. Due to the nature of the project, extensive investigations including survey works and an earthworks trial were undertaken prior to construction to help inform the design and tender processes. The findings of these investigations are now being used to solve construction challenges on site. 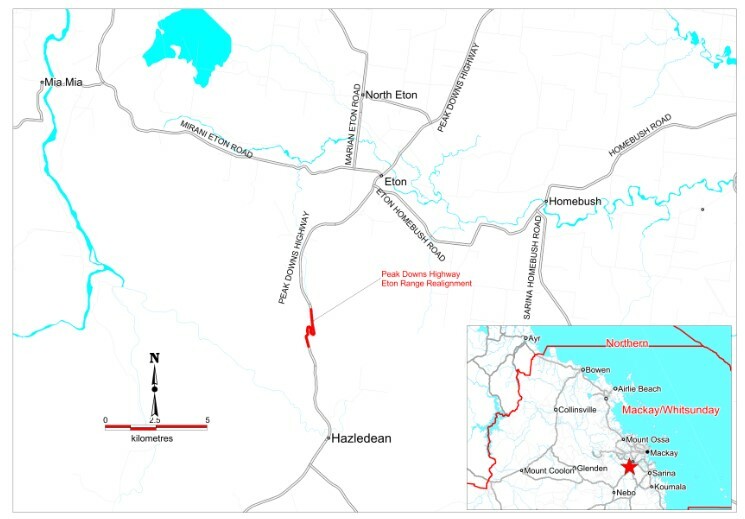 The project requires significant construction activity in an environmentally sensitive area due to existing koala populations, which has been factored into both the new alignment design and construction processes. Overview of the site looking south (towards Nebo) with the main reinforced earth embankment in the foreground. Side profile of the main reinforced earth embankment, completed in late 2018. A bird's eye view of the site looking north (towards Mackay). The construction process requires 3 stages of traffic management. The current stage is shown below. Although the works are being undertaken offline, reduced speed limits will remain in place throughout the works due to changed traffic conditions and regular movement of construction traffic in and out of work areas. Single lane operation may be required intermittently, and regular blasting works require the range to be closed in both directions for a short period of time.